In many cases, only a fixed set of applications are deployed on an embedded device, making it possible to save resources by minimizing the size of the associated libraries. The Qt installation can easily be optimized by avoiding to compile in the features that are not required. A wide range of features are defined, covering classes and technologies provided by several of Qt's modules. You can look up the different feature definitions in the src/corelib/global/qfeatures.txt file within the Qt source distribution. The feature can easily be enabled again by running configure with the -feature-<feature> option. See also Qt Performance Tuning. The -D option only creates a Qt internal define. If you get linker errors you have to define QT_NO_THREAD also for your project. You can do this by adding DEFINES += QT_NO_THREAD to your .pro file. If you want to disable a lot of features, it is more comfortable to use the qconfig tool. You can disable a set of features by creating a custom configuration file that defines the preferred subset of Qt's functionality. Such a file uses macros to disable the unwanted features, and can be created manually or by using the qconfig tool located in the tools/qconfig directory of the Qt source distribution. Note: The qconfig tool is intended to be built against Qt on desktop platforms. 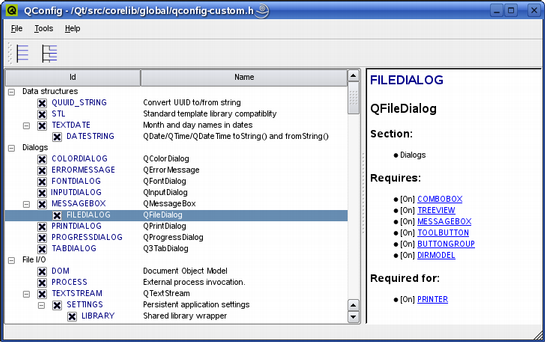 The qconfig tool's interface displays all of Qt's functionality, and allows the user to both disable and enable features. The user can open and edit any custom configuration file located in the src/corelib/global directory. When creating a custom configuration file manually, a description of the currently available Qt features can be found in the src/corelib/global/qfeatures.txt file. Note that some features depend on others; disabling any feature will automatically disable all features depending on it. The feature dependencies can be explored using the qconfig tool, but they are also described in the src/corelib/global/qfeatures.h file. Qt provides several ready-made custom configuration files, defining minimal, small, medium and large installations, respectively. These files are located in the /src/corelib/global directory in the Qt source distribution.